Do you ever feel like life is a battle? Do you feel overwhelmed, dragged out, and exhausted? If this sounds like you, chances are your health is suffering, too. In an effort to manage emotions and keep up with daily responsibilities, you may have neglected some very basic self-care, and now your body is paying for it. Hey, been there, done that. Eight years ago I felt burned out on life. I was 100+ pounds overweight, exhausted and at the end of my rope. I had been a martyr mom for many years, sacrificing nobly for my family….and sacrificing my health in the process. I had nobody to blame but myself. My husband tried to help, my kids would have cared for me, but I was determined to do this by myself or die trying. And I was on my way. My difficulty in accepting help stemmed from my own issues of feeling unworthy and linking my self-worth to my performance. It boiled down to the pain of rejection–and that’s something that all of us suffer at one time or another in our lives. The antidote to rejection is the love of God. That love is already there, but we have to begin the journey of understanding and accepting it. Get enough rest. This means different things depending on your season of life, but let’s face it—we often stay up too late scrolling through Facebook or….writing blog posts. Ouch. Exercise. How often do you “plan” to do a workout and then tell yourself that you don’t have time when it comes to the time you’d planned? Pretty quick to set aside a self-care ritual, huh? If you’re looking for a gentle but effective exercise program to love yourself back to health, T-Tapp is what I highly recommend and use. Take supplements. Maybe this is something you could skip in your younger days, but as the years pass and your body meets the demands of life, it can reach a state of depletion that is difficult to heal with food alone. Stress and responsibilities don’t take a break, so it may be time to admit that your health is not an expense—it’s an investment. My favorite and most effective supplements include a probiotic, cleanse, multi-vitamin and botanical extract drink from Plexus. Feed your mind. What are you doing to learn and grow? It’s never too late to get smarter—the latest brain research proves it! Listen to audios or free podcasts, read books or listen to audiobooks, or take a class. What are you interested in? Even 5-10 minutes a day adds up and can make a big difference in caring for yourself. Take time for small pampering rituals. Caring for nails, deep conditioning hair, taking a candlelight bubble bath or soaking feet in magnesium oil, applying lotion, whitening teeth….whether it’s a beauty ritual or a health treatment, these small acts of self-care fill a need for loving yourself in practical ways. Take a break or ask for help BEFORE a meltdown. When we think we don’t deserve to care for ourselves, we often push ourselves to the breaking point—almost as if we’re punishing ourselves for imagined offenses. Everyone’s circumstances are different as far as the help and care available from others….but all of us can make choices to acknowledge our human need for rest and care before an emotional or physical meltdown. We often don’t realize we’ve been neglecting our health and self-care until we get to a point of needing an intervention! But that’s the point where we need not only practical, hands-on help, but most especially a quiet time of reflection and awareness of our need for God’s love. Ask Him to help you take thoughts captive and retrain your thinking with truth. 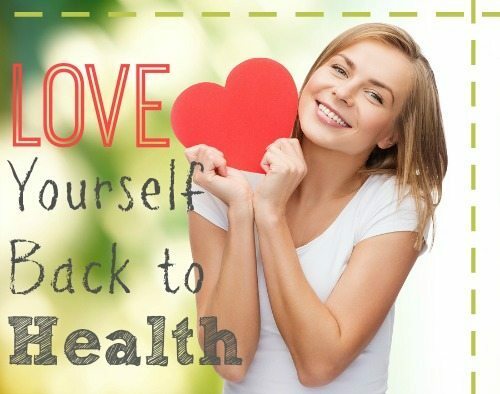 We all need a daily dose of truth and life-giving thoughts, and that’s possibly the most important way to love yourself back to health. Another great reminder, Charlotte, and very timely. I just got some answers to health questions I have been struggling with and the top priority is REST. That’s sure hard! Thanks for the reminder that God does not value me according to my productivity. God Bless!